Decorate your car with this eye-catching sterling silver religious mirror charm. 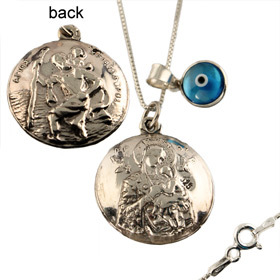 This two-sided platinum plated round charm features an image of St. Christopher "the traveler" on one side and the Virgin Mary on the other. On the chain is a Mati Evil Eye accent. The charm hangs from a sterling silver chain and has a clasp on one end. Fasten the clasp to the loop above the bead to hang from your rearview mirror, or any other place you may desire!